We’ve sold this ham at our Deli for ages, and frankly, I don’t know why it’s taken me this long to get my act together and offer it by mail. I get hungry just thinking about it. A full jacket of peppercorns balances the pork’s natural sweetness in a way that’s pure genius. Smoked pork and pepper, apparently, are one of those food combinations that’s meant to be. If you’re worried it’s too spicy, don’t be. I served some recently, and even the blandest tongues at the table, those who balk at anything spicier than mild salsa, thought it was amazing. The half ham is boneless and serves 3-5. It's been brined, smoked, and cooked, but not aged. Pairs very well with Spiced Crab Apples. 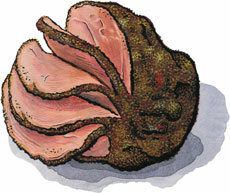 "Holy moly that Arkansas Peppered Ham is amazing! My wife made scalloped potatoes with that ham and its flavor permeated the whole dish!" The ham is ready to eat as is, but you can also warm it. Ships frozen.